There are different levels of seriousness when it comes to Mexico cookery. The hard working Mexicans at La Bandera Molino are taking the taco game to a higher plane altogether. La Bandera Molino is a molino, which is to say it’s a grain mill, a facility where corn is ground from the whole,dry state to make masa, the most essential component of tortillas. As near as I can tell molinos don’t exist in Austin, Texas which is why we’ll always be the weak sister to San Antonio when it comes to Mexican food. Riding around the west end of San Antonio the dining options are endless. Multiple taquerias per city block have my mind awhirl. I really need to pull up stumps and move down to San Antonio and spend at least a year just eating and writing. Once I get in the 300lb range I can sequester myself back in Austin and reflect back on those honeyed days of San Antonio taco life. It wouldn’t take long if I ate regularly at La Bandera Molino. Walking in bright and early on a recent Sunday morning a full crew of workers greet me anxiously. There’s not enough to occupy them so a patron commands their full attention. I look about the room at dozens of brightly colored, hand-written signs extolling the goods and sundries they’re selling before settling on one in particular; “Huevos Rancheros w/ Pork Chop”. I place my order and make my way to the cash register where I pay $6.79 and make my way to the dining hall in an adjacent room. Good handmade food takes time so when a half hour or so passes I don’t think too much about it. A grammar-school-age waitress brings me a tray of totopos cut from handmade tortillas and sputtering with fat. They’re too hot to eat, a trait you won’t find in a single Mexican restaurant in Austin. Eventually my platter arrives and it’s a signal affair. A good half pound, deep fried pork chop straddles a couple over medium eggs. Sauteed potatoes with bits of tomatoes and jalapenos sits off to the side near a goodly dollop of refried pinto beans. After a long night of rocking it at Iron Maiden followed by a long night of rocking it at an Iron Maiden tribute band after-party I’m flat starved so I tack into my plate like a starving dock hand. The eggs are cooked to a perfect turn, it’s almost as if they’ve been poached, so gentle is the preparation. The pork chop is a beauty. Thick and ruddy red it’s been deep fried but not hammered by the fat, retaining it’s elemental juicy-ness. Sauteed potatoes have been gently cooked with fresh jalapeno then tossed with fresh tomato. The refried pintos are rich with manteca and cooked down to almost a paste. Two tortillas accompany my food: A flour with multiple layers like a fine pastry and a thick, rustic corn fresh from the comal. A warm, spicy ranchero sauce sits in a monkey dish waiting to be doused over everything in site. La Bandera Molino is wondrous. A trip through the bounty of a fine, Mexican kitchen hitting on all cylinders. I can’t wait to get back to San Antonio and make my way to their competition and see where they fit in the grand scheme of molinos in Texas. 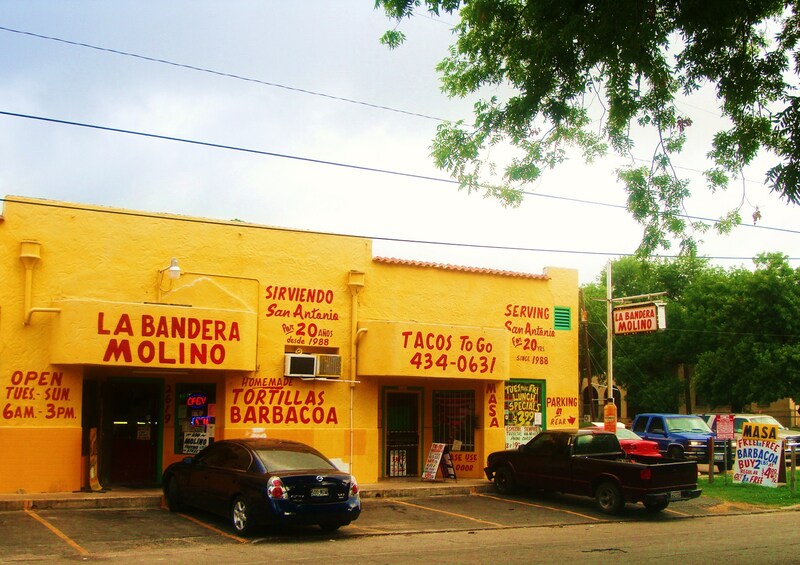 This entry was posted in San Antonio, The Foodist and tagged 210-434-0631, 2619 N Zarzamora St, la bandera molino, rl reeves jr. Bookmark the permalink. One-star? What does it take to get to two stars? Thanks for taking the time to respond. I really modeled my star system after New York Times where a star means it’s a good restaurant worthy of a visit. I know you’re a fan of Tacos el Rico and by way of contrast that would be a two star restaurant. Wow, NYTimes standards are pretty strict. I doubt there would only be a handful of restaurants in Austin that merit a star. Still, it’s good to have standards. 🙂 Enjoying the blog, hope you continue to post to CH as well. Haven’t given up on Chowhound just yet. The prim, maiden aunts who’ve been hired as the moderators have ran off a good half dozen of our favorite posters like knoblauch, Twill, MPH et al but I reckon I’ll stick around over there for a little while anyway. Breakfast Conundrum SOLVED. I’ve been complaining (endlessly) about not being able to get a decent cup of coffee and a great breakfast taco at the same time in San Antonio. This morning, on my weekly run to Brown Coffee (the best coffee I’ve found in SA), I decided to try the funky looking La Bandera Molino just down the block on Zarzamora. I had a machacado with egg and a papas with bacon and cheese. EXCELLENT, maybe rivals any tacos I’ve had in SA, perhaps better, especially the machacado. So, next time, I will get my coffee to go from Brown’s and eat breakfast at La Bandera. Life is good. Dang it Twill, they don’t sell the killer ones “to go” I asked. They sell decent ones for takeaway but you got to eat there to get the worldbeating ones. I’ll have to remedy that on my next trip. Thanks for the heads up.